Description: This tree is 50-100' tall at maturity, forming a relatively stout central trunk and an oblongoid to globoid crown. Trees in open areas have wider crowns than those in forested areas. The major branches of the crown are ascending (toward the top), widely spreading (toward the middle), or descending (toward the bottom). 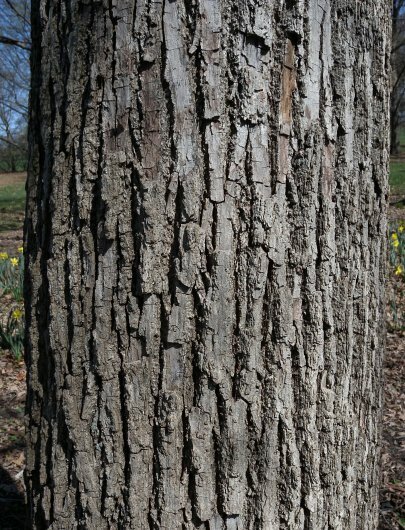 Trunk bark of mature trees is longitudinally furrowed with flat-topped ridges and rough-textured; it is mostly gray, except at the bottom of the furrows, where it is partially brown. The ridges are occasionally interrupted by horizontal fissures. Branch bark is gray and smooth with small inconspicuous lenticels, while twigs are reddish brown to light green and terete. Both the emergent leaves and their shoots are yellowish green and canescent to pubescent when they first appear during the spring, but they later become glabrous. At the base of each newly emerging leaf, there is a thickened deciduous bract that is greenish or reddish yellow, oblong in shape, and canescent. These emergent bracts wither away a short time later. Alternate leaves are arranged in two-ranks along first-year twigs. Mature leaf blades are typically 4-6" long and 3-4½" across, although the leaf blades of saplings growing in the shade can be up to 8" long and 6" across. Each leaf blade is orbicular cordate, cordate, or ovate-cordate with sharply serrated edges; the base of each blade is cordate to nearly truncate. The upper surface of the leaf blade is medium to dark green and glabrous, while the lower surface is pale green and mostly glabrous, except for small tufts of hair in the axils of the veins. Leaf venation is mostly pinnate, except for the lowest 1-2 pairs of lateral veins, which are palmate because they originate from the base of the blade. Drooping cymes of flowers about 1-3" across develop from the axils of the leaves. The peduncle of each cyme is about 4" long; the lower half of the peduncle adheres to about the middle of an elongated floral bract (about 4" long and ¾" across), while its upper half is naked. This floral bract is light green and linear-oblong to linear-oblanceolate in shape. The peduncle divides into pedicels with 5-20 flowers. Individual flowers are about ½" across, consisting of 5 cream-colored petals, 5 cream-colored sepals, a pistil with a white style, and several stamens with yellow anthers. The blooming period occurs during the early summer for about 2 weeks. The flowers are fragrant. Fertile flowers are replaced by small nutlets about ¼" across. At maturity during the fall, the nutlets are gray-brown, globoid, and canescent; they are dry, hard, and usually single-seeded. Because of the persistent bracts on their peduncles, the nutlets are distributed by the wind, although they usually don't travel far from the mother tree. The woody root system consists of widely spreading lateral roots. The deciduous leaves become yellow to yellowish green during the fall. Cultivation: The preference is full sun to light shade, mesic conditions, and a rich loamy soil with abundant nitrogen and calcium. Young seedlings and saplings can tolerate moderate shade. A mature tree casts considerable shade that can kill grass and other vegetation around the base of its trunk. Range & Habitat: The native American Basswood is occasional to common throughout Illinois (see Distribution Map). Habitats include mesic upland and bottomland woodlands, sandy woodlands, stabilized sand dunes near Lake Michigan, riverbanks, and slopes of wooded ravines. Because of its shade tolerance, American Basswood is a late successional to mature canopy tree in deciduous woodlands. Sometimes it is codominant with Sugar Maple (Acer saccharum). This tree is occasionally cultivated in yards and city parks. Because of its relatively thin bark, resistance to fire is poor, although this tree can resprout from its stumps. Faunal Associations: The flowers are cross-pollinated by bumblebees, honeybees, Halictid bees (green metallic bees & others), Syrphid flies, Tachinid flies, blow flies, Muscid flies, moths, and other insects. Most of these floral visitors obtain nectar from the flowers. Many insects and some mites feed on the leaves, wood, and other parts of American Basswood (including other Tilia spp. ); their damage is not usually serious, although the leaves and twigs are often disfigured by various gall-forming insects. The caterpillars of such moths as Catocala cerogama (Yellow-Banded Underwing), Ellida caniplaga (Linden Prominent), and Pantographa limata (Basswood Leafroller) feed on the foliage. See the Moth Table for a more complete listing of these species. The larvae of such long-horned beetles (Cerambycidae) as Dryobius sexnotatus (Six-Banded Longhorn Beetle), Saperda vestita (Linden Borer), and others bore through the wood (see Long-Horned Beetle Table). Other insect feeders include Popillia japonica (Japanese Beetle), the leaf beetles Baliosus nervosus (Basswood Leafminer) and Calligrapha tiliae (Basswood Calligrapha), Acrosternum hilaris (Green Stinkbug), Corythucha pallida (Pale Basswood Lace Bug) and Gargaphia tiliae (Basswood Lace Bug), the plant bugs Lygocoris tiliae and Neurocolpus tiliae, the treehopper Telamona reclivata, the leafhoppers Erythridula fumida and Erythridula vinaria, Eucallipterus tiliae (Yellow & Black Linden Aphid) and Longistigma caryae (Giant Bark Aphid), the larvae of Agromyza tiliae (Linden Bark Gall Fly) and Cecidomyia citrina (Linden Twig Gall Gnat), Thrips calcaratus (Introduced Basswood Thrips), and Diapheromera femorata (Northern Walkingstick). Several Eriophyes spp. (Gall Mites) form variously shaped galls on the foliage. The Insect Table provides a more complete list of these feeders. The value of American Basswood as a food source to vertebrate animals is more limited. The seeds/nutlets are consumed by the Bobwhite, Fox Squirrel, Gray Squirrel, Eastern Chipmunk, White-Footed Mouse, and Woodland Deer Mouse. White-Tailed Deer browse on the leaves and twigs, while rabbits browse on the foliage of seedlings and gnaw on the bark of saplings. Meadow Voles also gnaw on the bark of saplings: this often occurs during the winter underneath a protective layer of snow. 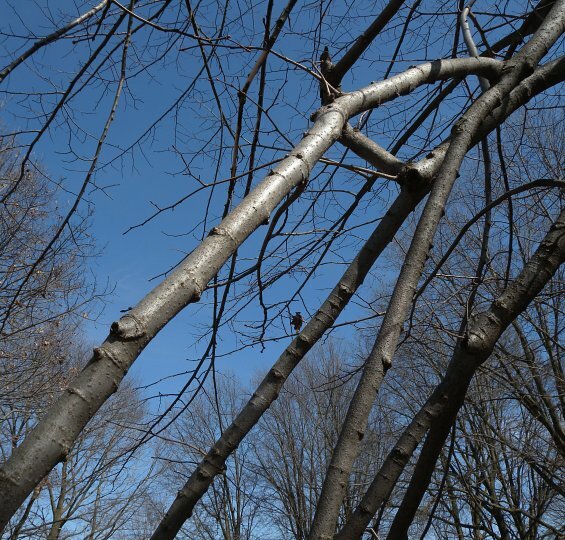 Because the wood of older trees decays easily and often forms cavities, American Basswood provides nesting habitat for wood ducks, woodpeckers, and other cavity-nesting birds; it also provides dens for tree squirrels and other mammals. Photographic Location: The photographs were taken at Crystal Lake Park in Urbana, Illinois, and at the Arboretum of the University of Illinois in the same city. Comments: The wood of American Basswood is light, fine-grained, and soft. It has been used to make hand-carved articles, boxes, wooden toys, bodies of electric guitars, cheap furniture, and pulp for paper. The name 'Basswood' derives from the word 'bast.' This refers to the stringy inner bark of this tree, which was used to make rope, woven baskets, mats, and fish nets. In addition to 'Basswood,' trees in this genus are referred to as 'Linden' and 'Lime' trees. The name 'Basswood' usually refers to North American species, while 'Linden' and 'Lime' refer to European species. However, this distinction is not always observed: another common name of Tilia americana is 'American Linden.' 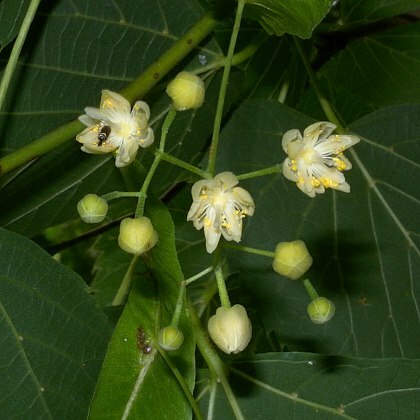 One other species that is native to southern Illinois, Tilia heterophylla (White Basswood), is very similar to American Basswood, except that its leaf undersides are strongly whitened by minute hairs. Some authors consider this species to be a variety of American Basswood, or Tilia americana heterophylla. There are some European species in this genus that are common in cultivation, although so far there are no records of their naturalization in Illinois. 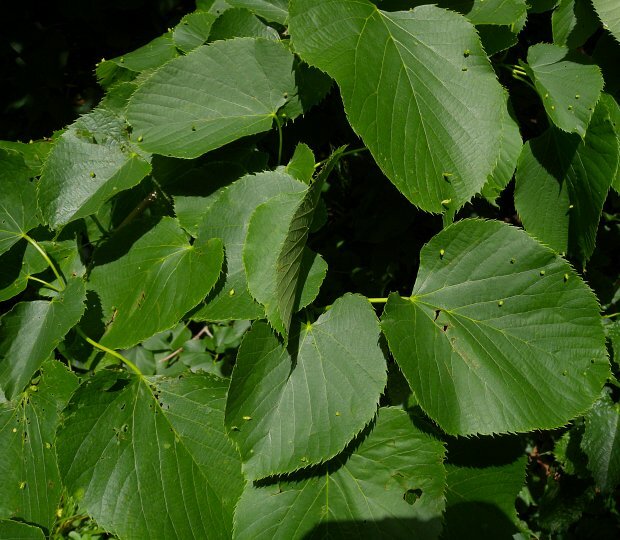 One commonly cultivated species, Tilia cordata (Small-Leaved Linden), is similar to American Basswood, except that its leaves are substantially smaller in size (3" in length or less). 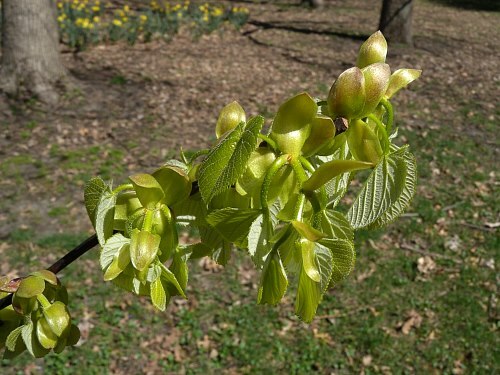 Another European species, Tilia platyphyllos (Large-Leaved Linden), is also similar to American Basswood because its leaves are nearly as large in size (up to 6" in length). However, Large-Leaved Linden has hairy leaves and petioles; it also produces its flowers in smaller cymes that have only 3-7 flowers. A hybrid of Small-Leaved Linden and Large-Leaved Linden is also cultivated; it has characteristics that are intermediate between the parent species.